Who Is Barclaycard Arrival Good For? The newest travel award program on the scene, Barclaycard Arrival, takes a very different approach than Chase Ultimate Rewards or American Express Membership Rewards. There are no transfer partners. No bonuses when you redeem for travel with airlines or hotels. Just use your miles to pay for travel directly. Ever since the Barclay’s Arrival card arrived, it’s been lauded as a strong alternative to the other newer player in the market, Chase Ultimate Rewards, and generally recommended as one of the top travel reward credit cards to get. Barclaycard Arrival is a good choice for people who want to accrue miles to pay for their travel, but don’t want to spend time researching awards. It seems a bit simplistic, and a lot of other transfer programs also offer the option to purchase flights directly through their travel websites, but what makes Barclaycard Arrival so powerful is the rate you earn points. With American Express Membership Rewards, you typically earn one point per dollar, and then redeem for travel rewards at 100 points per dollar, so you’re getting 1 cent value per point. With Barclays, you earn two miles per dollar spent and get 5 percent of your redeemed miles back so you’re getting a 2.2 cent value per mile, more than twice the usual rate. 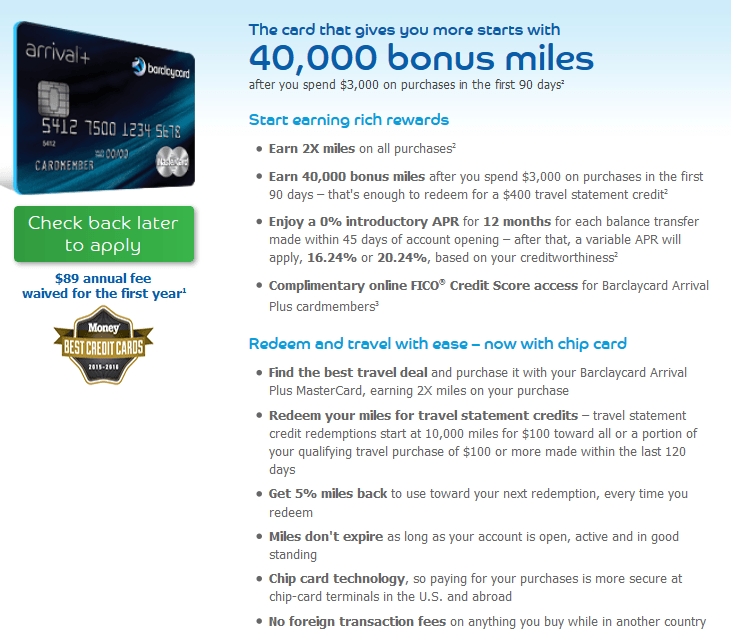 How Can You Use Barclaycard Arrival Miles? Barclaycard Arrival miles only come into play after you have purchased travel, which is great if you don’t have enough on hand when you need to book. In fact, you don’t even need to have enough Barclaycard Arrival miles to pay for the transaction for up to six months though you should pay off your credit card bill before then to avoid accruing interest. You can redeem miles as soon as the purchase posts to your account, or anytime in the next 180 days, through the Barclays website. Under the redemption section, Barclays automatically lists all transactions available for redemption. Transactions with airlines, travel agencies, tour operators, hotels and other types of lodging, cruise lines, train lines, car rental agencies, taxis, buses and limos are automatically displayed. Once you set the redemption in motion, they’ll also tell you how many points you’ll get back with the 5 % rebate, though they take a couple weeks to credit. The website also helpfully shows you how much time you have left to redeem each expense. The best value for Barclaycard Arrival miles is going to be the same as the best flight, hotel or other type of travel you’d find if you’re looking to pay cash. This is great if you’re already accustomed to getting good deals on flights, but if you’re used to paying with points or looking for a way to save money on flights, this isn’t it. Your savings will equate to how much time you put in looking for a good deal. Generally the best deals on flights end up being domestic trips, like finding a cross-country flight in the $200 range, for which you’ll need 20,000-something points, which equates to about $10,000 in spend. To get round-trip flights on most domestic airlines, the lowest redemption you can find is 25,000 miles, which you’ll usually need to spend $25,000 to accrue, so the Barclays Arrival program offers a huge savings for people who typically need this kind of flight. You’ll end up paying many more miles to earn business and first class flights through Barclaycard Arrival than with typical airline or transfer programs. If you pay with miles for a first class, round-trip flight to Europe on United, you’re paying 160,000 airline miles. If you have a card that earns the basic one mile/dollar, you’ll have to spend $160,000 to earn those miles. But if you pay for that flight at face value (often somewhere in the range of $7,000 to $8,000) and then reimburse it with Barclaycard Arrival miles, you’ll need to spend $350,000-$400,000 on the Arrival card to rack up that many Arrival miles. 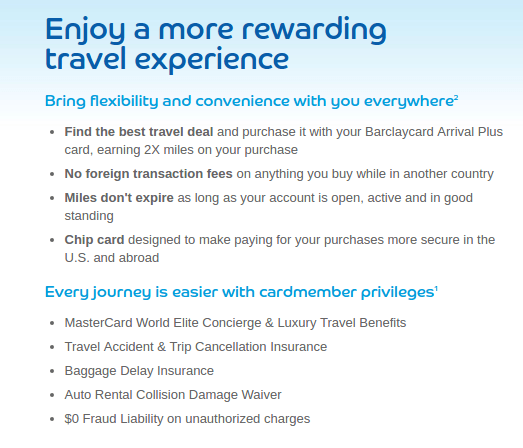 Two main cards that funnel miles into the Barclaycard Arrival program, the Barclays Arrival Plus World Elite MasterCard and the Barclays Arrival World MasterCard. The Plus card carries an $89 fee after the first year, and the basic card is free, but the fee is what gets you access to some of the most important perks of the card. The basic card offers only one mile per dollar on most purchases, reserving double miles only for travel and dining purchases, similar to the Chase Sapphire Card. Also, the difference in sign-on bonus 20,000 miles after $1,000 spend in 90 days for the basic card vs. 40,000 miles after $3,000 spend in 90 days for the Plus card is more than enough value ($220) to cover the fee for two years after the fee kicks in the second year you have the card.